Life is blasting along at it's usual breakneck speed. I am less than 2 weeks away from leaving for Fibre Week, the garden is only half-planted, and have several family events coming up this week, including a visit from The Odd-Lot bunch and Miss Julia's junior high farewell. All this and more, and I haven't even finished chronicling the last round of adventures! So I drag myself away from the oh, so delightful housecleaning and sit myself down at the computer with a cup of coffee to update the old blog. The sacrifices one must make! 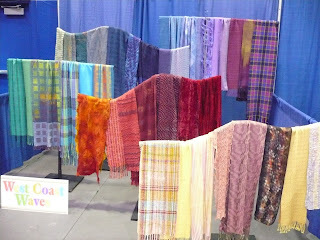 I left off between the Handweavers, Spinners and Dyers of Alberta and the Association of Northwest Weavers Guilds conferences. I thoroughly enjoyed the three days of bumming around Edmonton and woke up on Thursday, May 28 rested and ready to rock. Good thing, too, because I would need the energy to keep up the breakneck pace of the weekend! I got to the Edmonton International Airport with plenty of time to spare, checked my bags, finding that my Great Big Suitcase o' Supplies was a tad overweight. No problem, just pay the fee. Went through customs without any hitches, on to security. Where they pulled me and my carry-on aside and went through everything. My laptop was "sniffed" for explosives, my purse was gone through, then on to my knitting bag. Each item, including an astonishing number of sock needles (I have no idea why I felt it necessary to travel with five-yes five- sets of dpns. I guess I needed to be prepared in case of a sock apocalypse. Insert shrug here.) In the end, it turned out they were searching for a corkscrew that had worked itself behind the lining in my knitting bag and was lurking there, unbeknownst to me but clearly visible to the x-ray machine. Said corkscrew was confiscated and I slunk away, grateful that I had not been accused of trying to carry a concealed weapon onto the aircraft. After fortifying myself with a tasty soy latte, I boarded the plane. There is no direct route from Edmonton to Spokane, so there was a quick layover in Seattle, then on to Spokane. 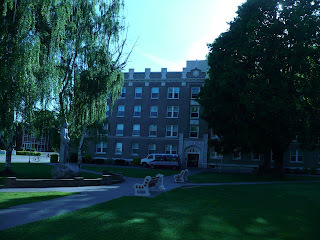 Grabbed my baggage and hopped into a cab to take me to Gonzaga University. 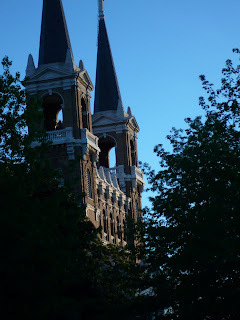 ...the iconic landmark at the heart of the campus. 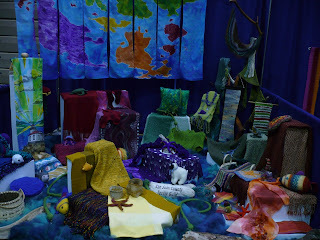 I had 3 half-day workshops scheduled during the conference: Fistful of Colors, Just the Flax, and Plying for Spindlers. I have to admit that they went by in a blur--half days are such a rush! Friday flew by, and by the time I had dropped off the Sonata with her ride (Hi, Deb! ), eaten supper and watched the fashion show, I was wiped out. ...which I cannot even properly credit until I rifle through my stuff and find the program. 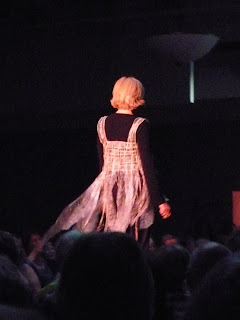 The piece was an airy, diaphanous tunic, woven entirely from sausage casings (aka, the lining of a pig's intestines). The beauty of the piece and the irony of it's materials just struck a cord with me. ETA: To give proper credit, as promised, the piece in the photo is "Visceral Vest" by Marcy Johnson. Louisa has already mentioned this in the comments, but I thought this should be here, too. Thanks, Louisa! Saturday came far too early. I had a small group for my Plying for Spindlers workshop, which was wonderful. (However, somewhere in the clean-up the day before, my handouts went missing and a big bag of fibre, too. Hope they show up some day.) I had a fun morning, grabbed what passed for a lunch and made a mad dash to the vendors, where I bought some amazing 4-ply merino/silk yarn from RedFish DyeWorks, which will become a pair of Fair Isle socks some day. I also got a great big bag of really awesome Polworth roving in the Parrot colorway from Rovings, and a wee Turkish spindle and some Guanaco (just a wee bit, that stuff is pricey!) from Herndon Creek Farm. I stuffed all this booty in with the bump of baby alpaca that I had purchased on Thursday evening from Rocky Lake Farm into my carry-on and dashed to the airport. By the time I got to the airport, I was hot and frazzled. Now, I freely admit that it doesn't take much to frazzle me, but I must have been a sight, muttering to myself and huffing around. I went into the ladies' room for a splash of cold water, and I shudder to think what an image I must have presented! A sweet young lady named Liz even offered to buy me a cup of coffee to settle my nerves. 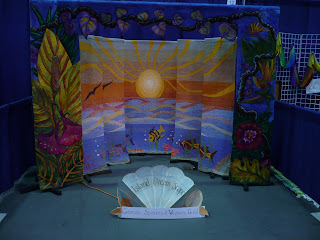 I declined her generosity, but we got chatting--turns out she is an artist with an interest in textiles. Talking string and cloth with her was just what I needed to ground me and get me back on track. That and another soy latte. Thanks, Liz! ...so how appropriate that we had Elvis as a flight attendant! 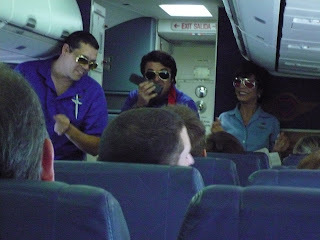 Okay, so he's an Elvis impersonator who also works as a flight attendant, but he was a lot of fun. He entertained us with renditions of "In the Ghetto" and, of course, "Viva Las Vegas", making this flight officially the Best Airplane Ride EVER! 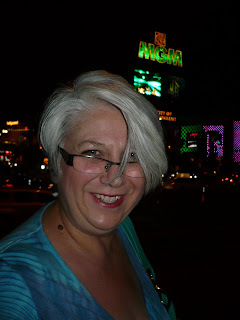 So I got to Vegas on a Saturday night, and what did I do? I had a hot bath and a nap. Yep, I'm old. ...and even took a picture to prove it. I look like I was having a lot of fun, don't I? But I was back at the hotel and in bed by 11. I was up and at the airport at 8 a.m. on Sunday for the next leg of my travels... North Carolina here I come! The garment made with hog casings is by Marcy Johnson and titled "Visceral Vest". It is indeed beautifully ethereal and I loved it too but my vegetarian buddy thought the materials used were gross. No accounting for taste as my old mum used to say!